We define competitiveness as the set of institutions, policies, and factors that determine the level of productivity of an economy, which in turn sets the level of prosperity that the country can earn. 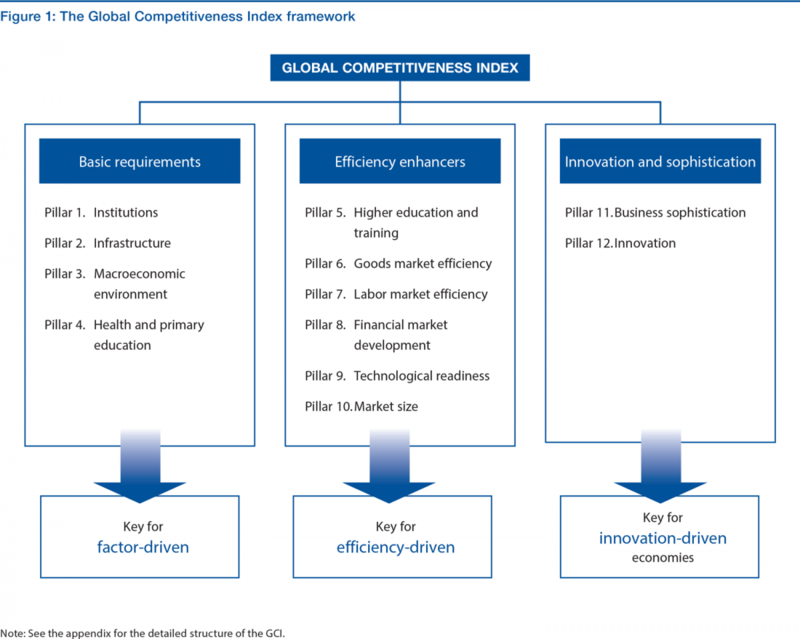 Building on Klaus Schwab’s original idea from 1979, since 2005 the World Economic Forum has published the Global Competitiveness Index developed by Xavier Sala-i-Martín in collaboration with the Forum. Since an update in 2007, the methodology has remained largely unchanged. The GCI combines 114 indicators that capture concepts that matter for productivity. These indicators are grouped into 12 pillars (Figure 1): institutions, infrastructure, macroeconomic environment, health and primary education, higher education and training, goods market efficiency, labor market efficiency, financial market development, technological readiness, market size, business sophistication, and innovation. These are in turn organized into three subindexes, in line with three main stages of development: basic requirements, efficiency enhancers, and innovation and sophistication factors. The three subindexes are given different weights in the calculation of the overall Index, depending on each economy’s stage of development, as proxied by its GDP per capita and the share of exports represented by raw materials. The GCI includes statistical data from internationally recognized agencies, notably the International Monetary Fund (IMF); the United Nations Educational, Scientific and Cultural Organization; and the World Health Organization. It also includes data from the World Economic Forum’s annual Executive Opinion Survey to capture concepts that require a more qualitative assessment, or for which comprehensive and internationally comparable statistical data are not available. This year the Report covers 140 economies. In this edition, because of absence of data, we could not include Angola, Barbados, Burkina Faso, Libya, Puerto Rico, Suriname, Timor-Leste, or Yemen. However, Benin, Bosnia and Herzegovina, Ecuador, and Liberia, which could not be included in the last edition, are reinstated this year. Altogether, the combined output of the economies covered in the GCI represents 98.3 percent of world GDP.5 The appendix contains a description of each pillar. It also presents a detailed structure of the GCI with all the indicators and explains how the Index is computed.